Every year some companies seem to make a huge splash in the fishing Industry. 2019 Will be no exception. You may have already heard of a few of these companies, but I expect these companies to really catch wind in 2019 and make their presence felt in the fishing industry. Even thought 6th Sense Fishing seems to have what I call and underground following, and its rather large at that. They are still what I consider a small company. 2019 may change all that. Owner Casey Scorzback has put a lot of time and effort into introducing newer designs, newer colors, and listening to angler across the country. Set for a launch of new topwater baits, terminal tackle, apparel, and more models of rods. In addition to adding baits, they have also hired and in house designer (Who’s name I wont mention) for 3-D Printing design, allowing 6th sense to design anything on the fly. Oh, and yeah they have some soft-plastics coming. II dont see any reason for 6th Sense to slow down. Also, you can now purchase a monthly subscription box that is tailored to your fishing style filled with premium 6th Sense products called the Super Six. 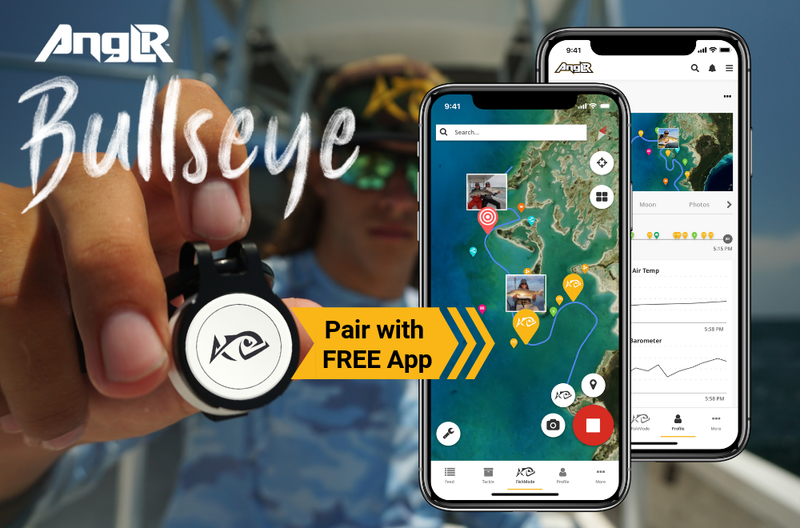 Anglr launched almost two years ago with their Tracker device that clips onto your rod giving any angler so much information, it could be well…overbearing. The concept was great, the technology was unbelievable, however many common fisherman struggled to integrate the system and technology into their daily fishing routines. Now, with the launch of a simple Bullseye device and a totally new platform, Anglr and it’s new Expert program will be on smartphones and laptops all across the country. Integrating new mapping, waypoint sharing, bait sharing, and even more catch information to help anglers study fish feeding habits,, weather patterns, and catch rates. Anglr is using social media and YouTube personalities to demonstrate the strength of their program and technology. You wont see average Joe Pro staff promoting it. Anglr and its developers insist they are trying to create a community of fishing information available at your fingertips on the fly. Omega Custom Tackle has been around for quite a while, infact over 10 years. But, with new ownership under Brad Fuller, the company has really started to re-emerge as one of the leading Jig/Terminal/Spinnerbait companies out of the Midwest. Omega has now started to dabble into the FLW Tour by becoming the Title Sponsor of FLW Pro Jeff Dobson. All products are made in the United States, and many are custom painted or assembled on a per order basis. From their Rapture Vibrating Jig or Genesis TI Spinnerbait only the best components are used. Omega hasn’t strayed far from it’s bread and butter. Their football and casting jigs are as good as it gets. With a social media following that is starting to gain more and more steam, Omega is soon to be a household name all across the country. I usually stick to baits, rods, or reels. But, I cant help but talk about AFTCO (American Fishing Tackle Company). With many FLW, Elite Series, and Major League Fishing pros starting to sport AFTCO wear you know the company is in for a big 2019. AFCTO is dedicated to creating the best clothing for fisherman from Sun Protection to Rain and Wind resistance. Tactical Bassin was the first major influencer I saw wearing their stuff. Now Scott Martin, Todd Faircloth, Dustin Connell are sporting the AFTCO Clothing Line along with youtubers Alexx Rudd Fishing and Tylers Reel Fishing. AFTCO seems to be dedicated to creating great clothing that appeals to anglers of all ages and also promoting growth of our sport and conservation. The new Proteus outerwear system may be one of the best foul weather clothing systems to hit the market in quite a while. Beast Coast fishing has been pumping out some unique products the last year or so. They are probably best known for the Miyagi Swiimbait and Magic Flick drop-shot bait. What started as a viral social media campaign has spiraled into a company that is now starting to see anglers gobble up their products. Not only are they still making top-notch swimbaits but incorporating tungsten into several jig models at an affordable price has steadily grown their company. Their newest baby the G-Spo Battle Flip, which was designed by MLF Pro Gerald Spohrer is a compact heavy duty flipping jig that features a double-wide weedguard not seen on any jig in the market. Rumor has it their new swimbait “The Creep” is going to be the real deal as well.